I couldn’t really conclude my 100-Day countdown without sharing my experience of going to see the actual movie. Within the first four days following the release I have seen the movie five times, experiencing it in a variety of cinemas/theaters in and around Los Angeles and Hollywood. My review in summary… ‘It was overwhelming… it was dreamlike, fantastic’. Did I ever doubt I would enjoy it? No, not really, but there was always a risk thanks to the expectation I had created for myself. I am happy to say that I was delighted to be shocked by revelations in the movie, having managed to avoid any spoilers in the run up to the release. I was also surprised how much I enjoyed all of the new characters versus the returning ones. My 'pre-excitement' for the last year or so had been at the prospect of seeing some old favorites, like Luke, Han and Leia, but in reality it was the enjoyment of truly wonderful and powerful new characters like Rey, Finn, BB-8 and Kylo Ren that made the film for me. Of course, it was wonderful to see the old favorites (including the Millennium Falcon which I count as a character), but once I had seen them, I found myself longing to see more of the new. What did I love about it? Everything. What did I hate about it? Nothing. I could ramble on and on about each character and what I thought, each element of the plot and how I viewed it and what I think about the unanswered questions in the movie, but I won’t... for now! I will just leave it there. Was it worth the 100 days counting down? You bet it was! Now, just like I did between the original movies back in the 70s and 80s, I will wait patiently for the next one and in the meantime, I will keep my enjoyment alive by collecting the merchandise … the bit I enjoy the most. Finally, the day is here. In just a few hours I will be seeing Star Wars, The Force Awakens, the seventh episode in a series of movies that has (as you have learned from my blog) made a great impact on my life and continues to do so. For those of you that feel ‘it is just a movie’, you are right: it is just a movie. But in a world filled with far too much fear, anger and hate, a movie that makes us feel good, unites us and entertains us can only be a good thing, right? 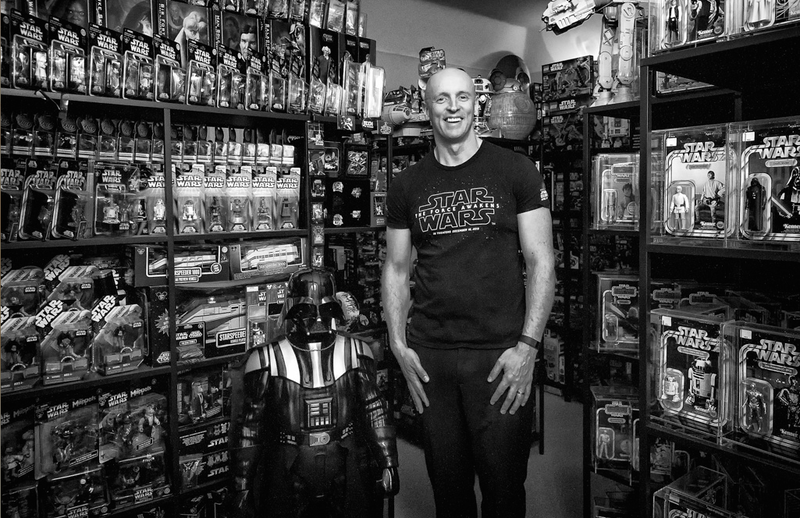 I certainly hope you have enjoyed this walk down memory lane with me, and although these are my personal recollections of being a Star Wars fan and collector for the last 38 years, I got the feeling from your comments that many of you shared some of these memories. These memories that I have shared over the last 100 days show just a snippet of the enjoyment that Star Wars has given me. I am confident there will be many more to add over the coming years, as a new era of Star Wars is upon us. My fondest memories will always be playing with my Star Wars toys as a child in my bedroom. They gave me so much enjoyment and taught me that the power of imagination is a great gift. In some ways I would like to think that my passion and loyalty to Star Wars over the last 38 years helped in the tiniest of ways to play a part in making this movie happen. After all, it was the fans during those many, many years without new Star Wars movies that continued to fund, through their energy and enthusiasm (and hard-earned cash! ), the Star Wars phenomenon, keeping going that spark of life within. I confess that I am feeling very emotional as I write this. Filled with excitement, anticipation and nostalgia, not just because I am about to finally see the movie, but because the journey I have shared over the last 100 days is about to come to a close. I have thoroughly enjoyed writing and photographing every single entry. My final wish is that if you go and see the movie (and I am sure you will), that for those brief few hours you let go of reality, don’t over-analyze, don’t be over-critical, just sit back and enjoy it for what it is … a great story being told. Thanks goes to all those that took some of your most precious time out of each of the last 100 days to read my blog. Special thanks goes to my mother Valerie Goldspink, Joe Loudermilk for this amazing photo, and my younger brother Peter Storey (sorry you got left on the cutting room floor with your entry!) . Extra special thanks goes to my husband and Star Wars companion for the last 31 years, Bradley Brady … you were right, maybe 50 days would’ve been easier, but hey, when did you ever know me to take the easy path?! As a kid my Star Wars collection primarily consisted of the Palitoy/Kenner action figures and vehicles. I managed to collect virtually every one released between 1978 and the mid 1980s, after which they were discontinued. These are now referred to as 'Vintage Figures'! They were well played with and I still have them all. I took great pride in my collection and would often display them all together for my family to see. I also memorized every name of every figure. I since went back and re-collected them mint on their original packaging. I had so much fun hunting them down over the years. These figures remain the most precious part of my collection. 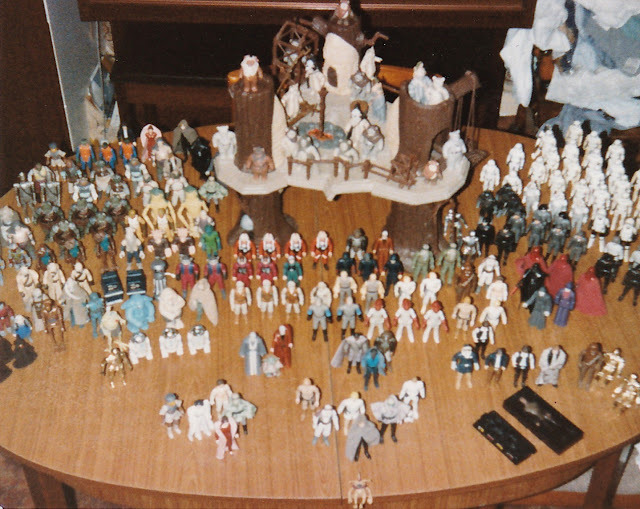 My Star Wars action figure collection in 1988. The vintage Star Wars action figures I have collected still on their original packaging. Unlike some Star Wars fans, I have always been very fond of the Ewoks. This affection led me to meet one of the lesser-known Star Wars celebrities. At a Star Wars convention in London some years ago, I saw that Katie Purvis, who played the Maternal Ewok in Return of the Jedi, was there and she was the only actor who had no line to meet her. I had to go and have a chat. She was such a lovely lady. More recently, at Star Wars Celebration 2015 convention we went to a panel presentation on vintage Ewok Collectibles. Who knew there were so many?! I was inspired, and although I already had a few cuddly collectibles, I decided the time had come to expand my collection of all things Ewok!